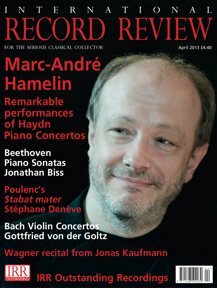 Appréciation d'ensemble/ Evaluation :"Overall, an important discovery in a tensely dramatic performance". Giovanni Battista Pergolesi is famous today for his bittersweet Stabat mater completed just before his death in 1736. But this may be the only reliable thing we know about Mm. Pergolesi’s first biography, written a century after his death, has turned out to be almost entirely a work of fiction. Of the 148 pieces published in the first complete edition of his works, only about 30 are now considered genuine. Dead and buried by 26, Pergolesi’s creative life spanned just six years, but as so often in the art world, death actually provided something of a boost to his career. Demand for his music rapidly outstripped supply and unscrupulous publishers began using ‘Pergolesi’ as a fashionable brand name for any old music they wanted to sell. This means that three centuries later separating the wheat from the chaff is a tortuous process. The New Grove Dictionary of Music meticulously sorts everything attributed to Pergolesi into categories of descending reliability, ending up with the ‘Doubtful’, the ‘Extremely Doubtful’ and the outright ‘Spurious’. For many years the Septem verba a Christo recorded here has been consigned to this last category; but in 2009 the musicologist Reinhard Fehling discovered a hitherto overlooked set of manuscript performing parts for the work at Kremsmünster Abbey in Lower Austria. They form part of a collection of music which was acquired directly from musicians of the Neapolitan School, including Pergolesi himself. While this provenance does not conclusively prove Pergolesi’s authorship, it does at least make it a stronger possibility, supported by significant thematic and stylistic links with his early oratorio La morte di San Giuseppe, also recently discovered. Fehling himself sensibly concludes that the value of the work ‘does not depend on whether Pergolesi actually wrote it’; though the conductor here, René Jacobs, tends to the view that the oratorio bas been ‘correctly attributed to Pergolesi’. Lovers of the Stabat mater will find little familiar ground here; the music is less melodically charming and more dramatically arresting. The language is ultimately derived from the secular cantata and opera house, though gloriously enriched. The form of the work takes its cue from the work’s title and poetic structure: a sequence of seven cantatas meditating on The Seven Last Words of Christ. Each cantata consists of a pair of arias; sometimes introduced by expressive accompanied recitatives, but the work was clearly designed to be performed as a continuous sequence involving an ongoing dialogue between Christ and Anima (the faithful soul). It’s ‘not a drama or a Passion’, says Jacobs, ‘but a meditative, didactic oratorio’. Unlike contemporary Neapolitan opera, the principal singer here is a bass, who takes the role of Christ and sings the opening aria of all but one of the seven cantatas; the role is inexplicably assigned to a tenor in the second cantata. Bass Konstantin Wolff adopts a slightly faceless seriousness of tone, modulated by a vibrato which sometimes masks real tonal quality and focus. In the plainsong-like introductions to each cantata, which is where we hear Christ’s seven last utterances, his pitch can seem unstable. It’s actually the extraordinary instrumentation and expressive richness of the accompaniments which bring real colour and dramatic excitement to Christ’s arias. In the framing arias Christ is given a ‘halo’ of a solo horn; while in the disquieting opening aria of the fourth cantata a muted trumpet symbolizes his earthly sufferings. I’ve never heard a Baroque trumpet more eerily played than Ute Hartwich does here. In the second cantata, a solo harp accompanies Christ, now sung by tenor Julian Behr. To my ears, the most obviously Pergolesi like moment of the oratorio is the second aria, where the tuneful phraseology reminds me strongly of moments in the Stabat mater. At the same time the soloist, countertenor Christophe Dumaux, reminds me of a young Jacobs himself, and more so in the alto aria of the fourth cantata, with its extravagantly ornamented viola part. It’s a rather back-of the-throat kind of countertenor timbre, expressively deployed but oddly unmoving. With her alto and tenor colleagues, soprano Sophie Karthaüser shares the seven arias allotted to Anima the soul of the believer. This particular soul is rather tremulous in her application of vibrato, but when it comes to the biggest bravura virtuoso showpiece of the oratorio in the third cantata, she underplays her coloratura phrases and leaves the razzle dazzle to the glittering horns. Overall, Jacobs directs a performance which latches on to every opportunity for dramatic intensification: there’s lots of sotto voce panting, powerful mood changes, rhetorical pauses and gestures at every turn, sudden acceleration or deceleration, the occasional withheld da capo, and linking passages for the continuo between adjacent arias which may or may not be editorial additions. There are times when the music seems almost over-dramatized and interpreted, as if this nervy, restless quality is required to keep our attention keen. The music could work much more simply, and sometimes that would have been effective. 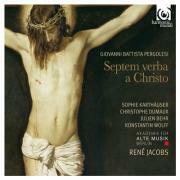 The Septem verba received its modern concert premiere at the Beaune Festival in July 2012 and this recording, made shortly after, is also a first. And not a last, I hope. There’s a more direct line to the beauty and dramatic intensity of the music than found by the singers here, though the instrumental contributions of the Berlin Academy for OId Music will be less easily surpassed. Fehling, the driving force behind Septem verba’s rehabilitation, is absolutely spot on when he says that its value isn’t dependent on Pergolesi’s authorship, though CD sales might be. Overall, an important discovery in a tensely dramatic performance.